Imagine you are on an assignment for an intelligent, thoughtful travel publication (not tourism promotion) that is demanding a considered, in-depth treatment. Aim to show the character of the place and of the people who live there with as much visual variety as possible. Pick a place that you know well and have sufficient access to in order to complete a strong selection of images. My aim was to make a set of images that would be suitable for an in-depth article in a publication such as a weekend magazine. My intention was to show Regents Canal as a place that is both a tranquil haven within the city and a fun place for leisure that is used by locals and visitors alike. In addition I wanted to show the varied styles of living along the banks of the canal. Overall, I think I have achieved my aims. I planned images with no people or a single person, green trees, reflections of clouds in the water all emphasise tranquillity. Canal boats, apartments and a mansion, it doesn't come more varied than that for living styles. 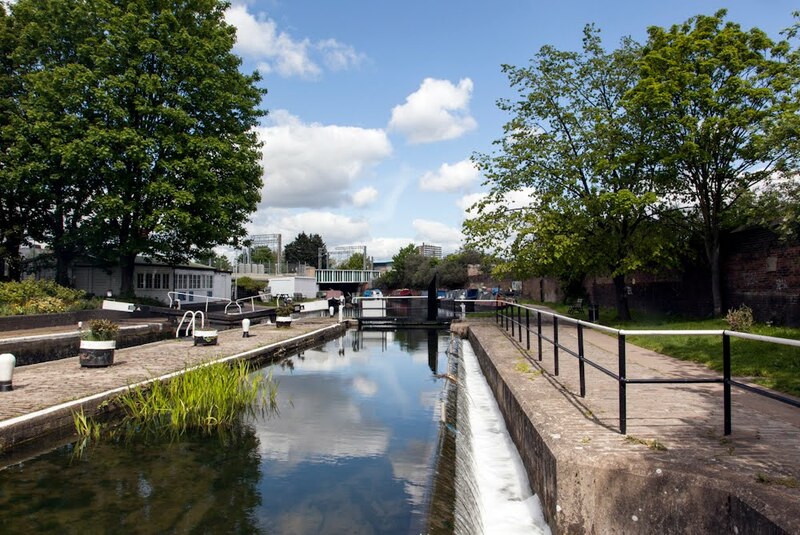 I would have liked to have had access to a canal boat and taken pictures from that perspective, but I didn't have that opportunity and I couldn't trespass onto someones boat. 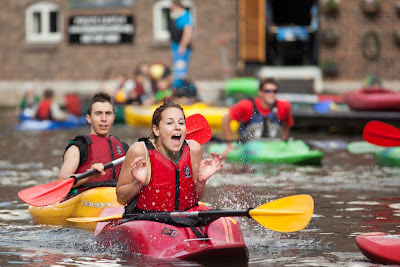 Despite this, by using various lens and focal lengths I feel I managed to create a sense of life on and off the water. 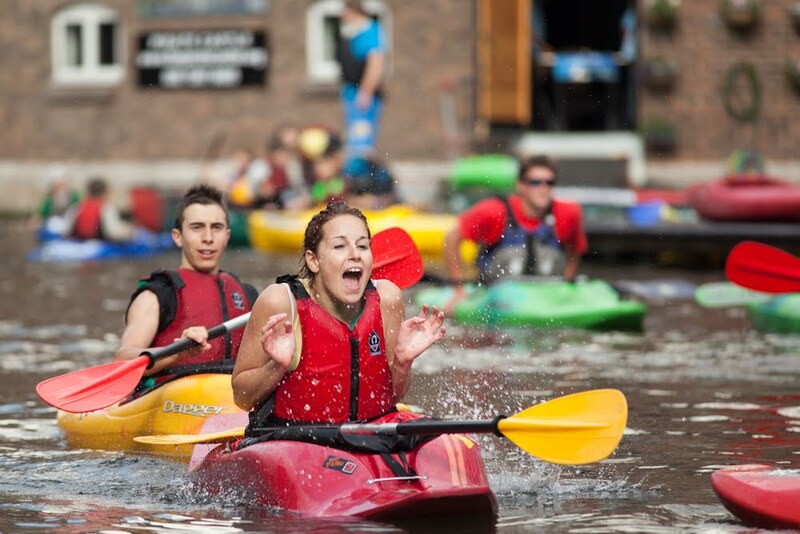 The image of the kayakers is an example of how I have successfully achieved a sense of being part of the activity on the canal. Having a brief to refer back to and knowing what I was trying to achieve made it easier to stop taking the same picture over and over and focus on the overall outcome. There were days that I was guilty of that but, I would come back and assess what I had taken ask myself if I had achieved my goals. If not, I would go back with the specific intention of looking for a picture that would fulfil those aims. The brief gave a theme that enabled me to think about the type of photos I needed to take to meet my aim of conveying the overall picture of Regents Canal in all its facets. 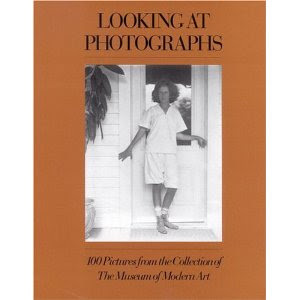 My first choice was a nostalgic one - to photograph rue Manuel in Paris. Having lived there for four years I know the street very well and planned in advance what photos I would take, I am very familiar with the market and know lots of locals. Every Sunday until 1pm the street is closed to traffic and becomes a real French market. It is a local event not something on the tourist trail. I was going to be in Paris and would have the opportunity to photograph the street, although I would only be able to have one day to get all the images I needed. I knew this was a risky option, as there were tight time constraints with little or no contingency. So I had a backup option that I knew would have lots of flexibility and contingency. I live close to the Regents Canal, and again, I am very familiar with the area, and it is easy for me to visit it often. The Paris project didn't happen. The weather was awful. I'd organised to take photos from the balcony of a friend's apartment to support my on the ground photos, but she was ill on that weekend. It was always going to be difficult to pull off and the weather really just made it impossible as the casual bonhomie I was looking to capture seems only to occur when it's hot weather and this was not ideal for a "thoughtful travel publication". Back in London I now focused on the Regents Canal project. 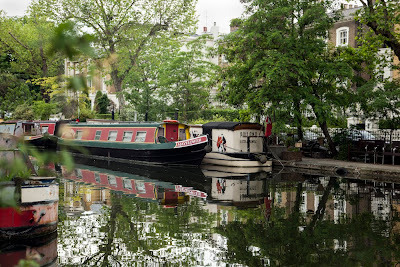 I imagined a travel pull-out like those in the Sunday newspapers, as they are the types of publications that would show an in-depth view of Regents Canal. 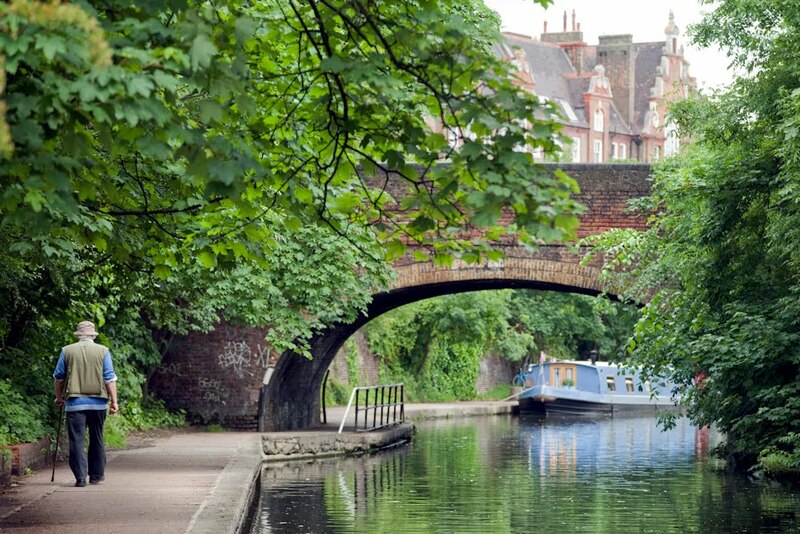 The article would appeal to visitors to London who might like some respite from the bustle of the city and to those who like canal boat holidays. It would also appeal to locals who don't know or have forgotten about the treasure so close to them. My aim was to emphasise the tranquillity of the canal. In the centre of a frenetic city you can also experience a peace normally associated with the countryside. It is also a place where all age groups find fun in leisure activities. I planned to take photos showing people interacting with the space, drawing on the skills and techniques used in the exercises leading into this assignment. shots taken from along the towpath showing people using the space for leisure, both along the towpath and on the water. photos that would use the techniques in the exercises; a single small figure, a figure as an accent, busy traffic, people unrecognisable, figures anonymous, a matter of balance, and at least one image that used special post processing. The biggest problem was also the weather. Day after day of rain. If it wasn't raining it was overcast with flat light. Although rain doesn't prevent me taking photos, they none the less would not be ideal for a travel publication. Another problem I had to work around was that parts of the canal are not exactly charming and pretty. Litter and graffiti that were difficult to keep out of many scenes. There is a lot of work taking place along the banks of the canal, which means buildings with scaffolding or bright orange cones detracted from the pictures. 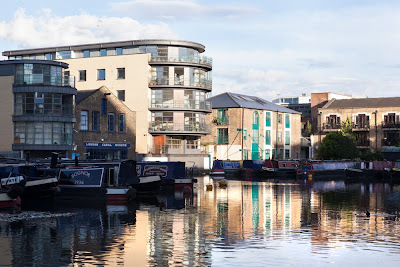 Initially I intended to photograph the section of the canal from York Way to the St Pancras Lock. After a couple of weeks of shooting I realised I was going to have to find prettier parts of the canal, with or without ideal weather conditions. I was unable to get access to take photos from on the water. I was unsuccessful in gaining access to private boats. I tried taking a public canal bus but the passenger restrictions on where and how you sit aboard made it too difficult to get suitable photos. I could have chartered my own boat but this would have cost me £200 which I couldn't afford. I was unable to get access to any of the few tall buildings that would give me my aerial shot. I couldn't do anything about the weather but I could take photos in a way that I would be able to use processing techniques. For example the photo of the mansion I have merged three images together to have some detail in the sky and the dark shadows on the edges of the water. I walked miles and miles of the canal finding sections that I could make look attractive for my imaginary publication. I couldn't get on the water, but I could vary the lens I used to give a sense of being closer or further away. I couldn't get an aerial view to give a sense of place so I looked for an alternative. I photographed a sign in one of the gates and cropped it tightly. A closely cropped image of a gate leading to the canal. The aim was to let the viewer know exactly where they were being shown. A working canal boat just about to go under a bridge. I have used one of the techniques from the exercises, making a figure anonymous. 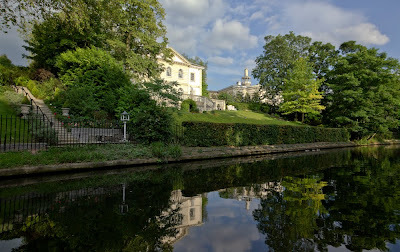 I have also stitched two photos together and cropped it into a long narrow image to give a sense of both being on the water and the sense of narrowness. I have learnt from my research that because of the width of the canals in the UK the canal boats are narrower than in Europe and hence called narrow boats. A few of a lock. This image and image 7 were taken to show the same place taken at the same general view point varying the composition, balance and attention to the setting. The mansion. To suggest the opulent living along some sections of the canal. This image was achieved by merging three images together, to get a lovely sky and detail in the shadows. This was difficult to achieve as I had taken the three pictures with my camera hand held. When merging I had problems with ghosting. I tried various software until I got an image that was successful. I did try reshooting the image but I didn't get another day with any hint of blue sky, even this day it only lasted an hour. I didn't have a tripod with me but wanted to capture elusive blue sky anyway. An anonymous figure. Leisure and living. 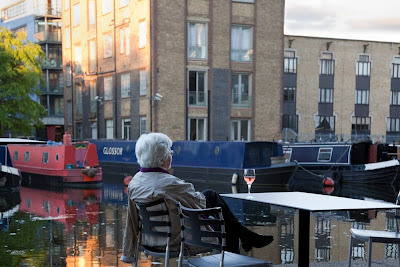 A woman enjoying a glass of wine from a restaurant, looking out to apartments and house boats. Another view showing how people live in houses and house boats side by side. 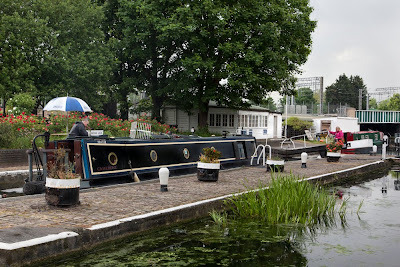 St Pancras lock. See comments under image 3. 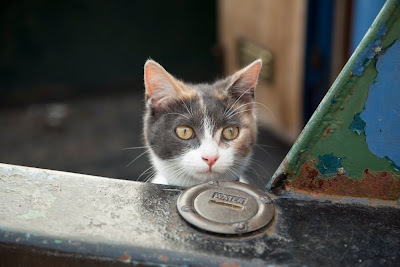 I didn't manage to take attractive portraits of people living on house boats so I took this one of a kitten on a house boat that implies people live here. A figure as accent. I planned an image that would have the figure as a silhouette. In the images that I considered I didn't have the figure exactly where I wanted it, either they blended too much into the background or I had clicked the shutter a few seconds too late. I selected this image as the man is not dominate in the scene. The man with his blue shirt creates a point of interest in the bottom left of the frame that links to the blue boat and reflection in the water. If he wasn't there the left hand side of the picture would be uninspiring as an empty path and dark green foliage. A single figure small. A woman is standing on the balcony second from the top. This was difficult to find for the exercise and equally difficult to repeat for the assignment. Although very small shows that people live there which you don't get when there is no-one in the picture. The imaginary publication is about travel and although it is not to promote tourism you still want to feel you'd like to go there. This image is about having fun. 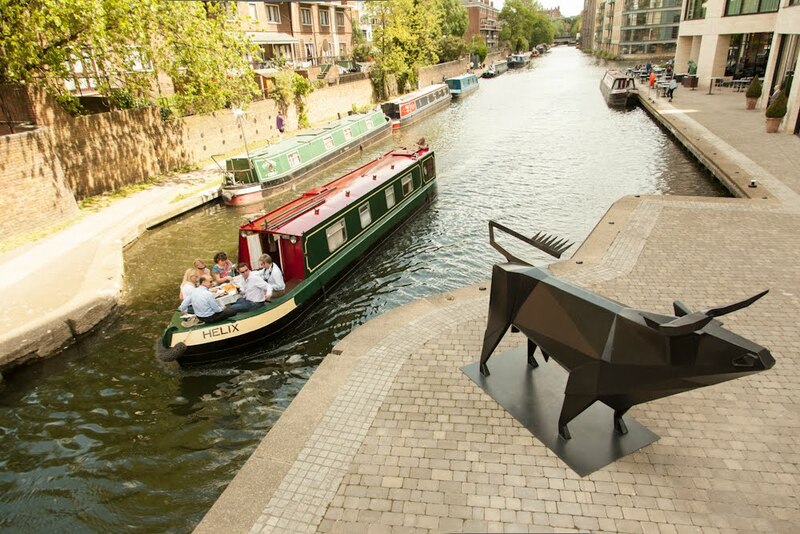 A group of people enjoying a meal on the canal boat come across a quirky art sculpture along the route. Planning an image to show busy traffic was the most difficult. This image wasn't planned. My intention was to take something from Camden Lock looking toward the market. On my way I came across this kayak school. Not only did it give me busy traffic but there was sun catching the brightly coloured kayaks. The only day of sun in the whole exercise and it only lasted just half an hour. This is my favourite image. I had good light, I was in the right place at the right time and managed to capture the essence of the moment. This would be my signature picture for the publication.